Quality was in the eyes of the bidders in the multi-billion dollar United States rare coin market during 2018, according to a year-end tabulation conducted by the Professional Numismatists Guild (www.PNGdealers.org), a nonprofit organization composed of many of the country’s top rare coin and paper money dealers. 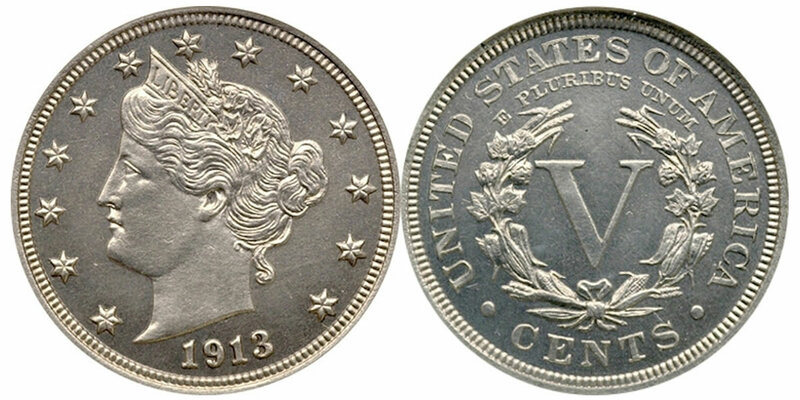 The most valuable U.S. rare coin sold in 2018 was the finest example of a 1913 Liberty Head nickel, sold at auction for $4,560,000 by Stack’s Bowers Galleries and graded Proof 66 by Professional Coin Grading Service. (Photo credit: Professional Coin Grading Service www.PCGS.com). Based on responses to a year-end PNG questionnaire, the aggregate prices realized for all U.S. coins sold at major public auctions in 2018 totaled more than $345 million, compared to $316 million in 2017. Two auction companies, Heritage Auctions and Stack’s Bowers Galleries, accounted for over 70 percent of the overall total with Heritage reporting the largest amount of U.S. coins sold at auction during the year, $187 million. The PNG estimates the overall U.S. rare coin market in 2018 was over $4 billion not including sales by the United States Mint or bullion coins, such as gold and silver American Eagles. "With the stock market dropping during the fourth quarter of 2018 we saw an increase in interest in the rare coin market with some people taking profits from stocks and buying coins that have proven to show sizeable and consistent increases in value over the years, as well as buying precious metals," said Professional Numismatists Guild President Barry Stuppler. "There was continuing strong demand in the numismatic market on superb quality and rarity throughout the past year. In addition to high-grade vintage coins that set records, some modern coins that are the finest known, what we call ‘condition rarity,’ also commanded amazing prices," explained Stuppler. One of those examples is a 1987-dated Kennedy half dollar graded by Numismatic Guaranty Corporation as Mint State 68 (on a scale of 1 to 70) which sold for a record-smashing $4,800 in a Stack’s Bowers Galleries auction. A similar 1987 half dollar, graded by Professional Coin Grading Service also as MS 68, sold in 2014 for $3,290 by Heritage Auctions, an increase of over 45 percent in only four years. In circulated condition, 1987 Kennedy half dollars are simply worth face value, 50 cents each. Among the most popular U.S. coins are Morgan silver dollars, struck from 1878 to 1904 and again in 1921, and named after their designer, George T. Morgan. An 1897-dated Morgan dollar struck at the New Orleans Mint and graded PCGS MS 66 was sold by Sotheby’s in 2018 for a record $262,500. The same coin sold in 2015 in a Legend Rare Coin Auctions sale for a then-record $108,688, an increase of over 140 percent in three years. and $1,740,000 by Heritage Auctions for a 1792 Washington Eagle ($10 denomination gold coin), graded NGC Extremely Fine 45. The Professional Numismatists Guild was founded in 1955, and its member-dealers must adhere to a strict code of ethics in the buying and selling of numismatic merchandise. For additional information and a list of member-dealers, visit online at www.PNGdealers.org or call the PNG headquarters in Temecula, California at (951) 587-8300.